If the medieval atmosphere and buildings around Volterra look vaguely familiar, it may be from the Twilight movies which were filmed around the piazzas and streets of Volterra, representing the seat of power of the vampire coven, the Vulturi. You don’t have to worry about encountering vampires as you stroll around the perfectly-kept streets of Volterra, though; in fact, you don’t have to worry about too many tourists, either. Despite its location just 20 miles from the super-famous San Gimignano, Volterra gets a trickle of tourists rather than the flood of buses that crowd San Gimignano. That doesn’t mean Volterra is any less alluring; in fact, it is one of Tuscany’s best preserved and most historic towns, with a history dating back more than 2,500 years. Volterra retains relics from the Etruscans, the Romans, the Middle Ages, and the Renaissance, all packed within the town’s ancient walls and surrounding countryside. 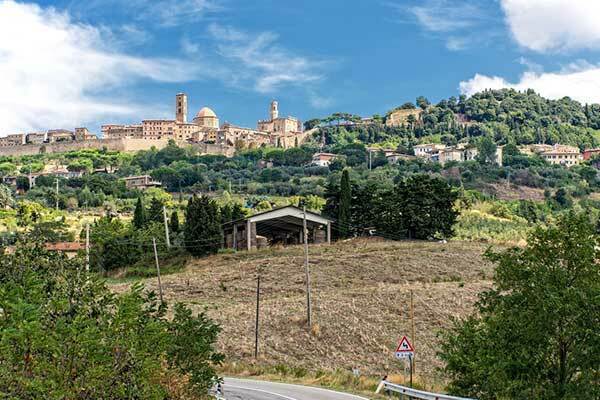 Its gentle hills give way to more rugged terrain to the east towards Siena, and unfurls toward the Mediterranean Sea to the west, less than an hour away. Called the City of Alabaster, artisans have been mining and crafting the stone in Volterra since the Etruscans and have honed it to a fine art form. It is also consistently listed among the most beautiful towns in Tuscany, ranking along with better-known Cortona and Montepulciano. But while tourists find their way here, it does not have the high tourist numbers found in other parts of Tuscany, leaving Volterra with a sense of local life and identity all its own. Olive groves, cultivated fields, and vineyards punctuated with stately cypress trees give that classic Tuscan landscape, while the town itself preserves its Old World splendor–but with high speed internet, a hospital, and cultural offerings. With about 10,500 residents, Volterra offers a small-town ambiance with all the things you need for daily life, Tuscany-style that is—surrounded by beauty. There are supermarkets, delicatessens, wine bars, coffee bars, and a plethora of restaurants. The cities of Siena, and Pisa with the closest airport, are just about an hour away. While Florence with all its glories is just 90 minutes away. The climate in Volterra is like most hill towns, with warm, dry summers and cool, humid winters. Average summer highs are 77 F, typically, falling to 65 F at night for easier sleeping. The wettest months are October and November. Winter highs average 45 F during the day with night temperatures around 38 F. Spring and Fall are pleasantly cool with average temperatures of about 60 F.
Volterra has a hospital facility; more specialized, larger medical centers are found in Siena, Grosseto, Florence, and Pisa, all less than two hours away. The hill town wraps around the low summit with a castle, bell towers, and domes forming its golden-brick skyline against the lapis sky and patched green hills. Falling within the DOCG (Denominazione di Origine Controllata e Garantita) Chianti zone, the highest classification Italian wines can be awarded, you’ll find excellent wines along with exceptional olive oil being produced in Volterra. Cuisine here is hearty Tuscan fare, but due to Volterra’s proximity to the sea, fish dishes are plentiful too. The choice of eateries is abundant for a small town with options ranging from simple to upscale. Volterra offers a wealth of historic and archeological sites, from an Etruscan acropolis and walls, to the Roman theater and medieval monuments. There are nearly a dozen museums, plus churches with artwork to admire, and cultural offerings that won’t leave you bored. The Piazza dei Priori is one of Italy’s prettiest squares containing the oldest town hall in Tuscany, dating to 1208. The piazza is hemmed in by frescoed palaces and is an enchanting public space. The city is encircled by its ancient walls and retains some of its original gateways, and the tidy network of streets open into postcard-perfect piazzas and wind through the historic center, flanked by stone “tower-houses” and stately homes. The town has a Florentine flair to it, and stone arches curve gracefully over the lanes. The cathedral’s spare stone Romanesque facade hides a candy-striped marble interior, and the civic art gallery houses works by Ghirlandaio, Signorelli, and more. This is Tuscany, after all; art is everywhere. 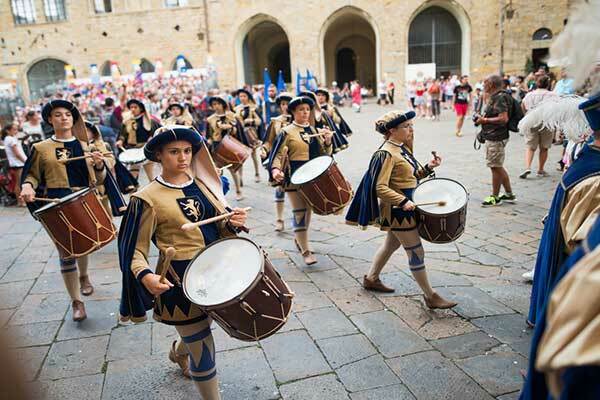 Food festivals, a medieval fair, and a rollicking Palio event are a few of the annual happenings that enliven Volterra. Along with concerts, art exhibits, and a well-rounded theater season in the classically-styled Teatro Persio Flavio. The evening passeggiata is a nice way to enjoy a stroll and time with your neighbors, maybe stopping for an aperitivo along the way. Savor the Tuscan specialties around town, where you can fill up on a plate of homemade pasta with wild boar sauce or with fragrant truffles, rejoice in the grilled meats, and wash it all down with local wine. Stores and the weekly market provide local produce, at its peak of freshness. The beach is only a half-hour away, probably the best in Tuscany, with a nature preserve right at the water’s edge where the sandy beaches are backed by pinewoods and where the water is pristinely clear. Inland, the Nature Reserve Berignone is a forested haven with streams and the Cecina River running through it, providing fresh-water swimming holes. Hiking trails lead to beautiful rocky outcroppings, and canyons with wildlife and tranquility to be enjoyed. In fact, the only downside to Volterra is its lack of public transit and rail options as there is no train station. Most of Tuscany is expensive, but Volterra is still one of the exceptions. Despite having a high quality of life, pleasant atmosphere, a stable economy and lots of local business activity, the real estate prices aren’t through the roof. In some cases, they’re quite affordable. 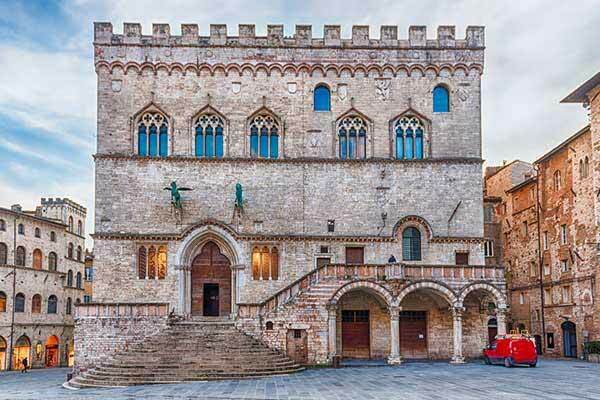 For example the average price per square foot is $203 in Volterra, compared to $325 a square foot in Siena and $268 in San Gimignano. Rentals are reasonable, starting at $515 a month. There is a two-bedroom on two levels in a restored farmhouse in a resort-like complex with a pool, garden, and stunning views that is renting for $630 a month. Around town, rents are around $973 at the top end. Some examples of home listings in the area show a good level of affordability, with homes ranging from €85,000 up to several million dollars. A restored two-bedroom apartment in the town center with a separate kitchen, a balcony, and a stone-built cantina for wine storage is on offer for $113,444. Just five minutes from town, a stone farmhouse built in 1800 has been completely restored with three bedrooms, two bathrooms, wooden beams, ample terraces, a sunroom, country kitchen, living room with fireplace, and nearly an acre of land with olive trees. The price is $372,418. In Volterra a theater ticket costs $21 per show, or you can get a season pass for $142. Dining out is affordable with a plentiful array of trattorias. You can get a heaping plate of handmade pasta for $10.30, and a finely grilled steak of local beef for $17. Some places also offer full daily menus for around $20, including house wine. There are upscale places for special dinners, too, with menus from around $57 per person, for carefully prepared courses. There is also a heavy emphasis on eating locally, so farm-to-fork restaurants are common, and not at the $30 for a single plate you’d pay in the U.S., either. You can buy some of the area’s bottled vintages for less than $10. A pizza and beer will cost you about $10. Or you can pack a picnic and enjoy a day at the beach paying just $20 or so for an umbrella and lounge chair. And of course, a stroll around town, the breathtaking views, and walks in the area’s forests and parks are free.